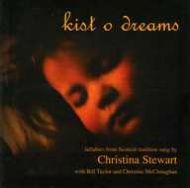 The simple idea behind kist o dreams was to help parents sing traditional lullabies to their babies by giving them free access to a range of Scottish songs. Given that bringing a baby into a home involves a great deal of upheaval, I had to decide the most useful way to do this which would be easy for parents to take advantage of. The free distribution of CDs had to end when the funding ran out for this element, but they were so popular that they are now commercially available, and visits to groups continues on an occasional basis on request. To buy a copy of the CD, please click the cover image below.